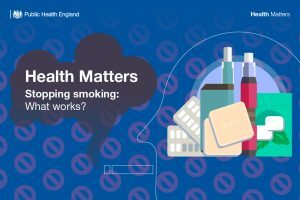 Welcome to the latest edition of Health Matters, PHE’s professional resource, which for this edition focuses on the range of smoking quitting routes that are available and the evidence for their effectiveness. It also explores perceptions around nicotine and e-cigarette safety. 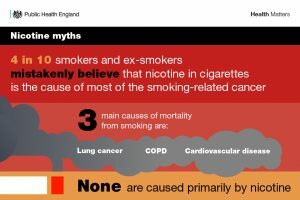 Smoking remains the leading cause of preventable illness and premature death in England. In 2016 alone, there were estimated to be 77,900 deaths attributable to smoking, representing 16% of all deaths across the UK. Our smoking prevalence rates have continued to decline year on year and are now at a record low with 14.9% of people aged 18 years and above being smokers. However, inequalities persist and there are still groups where smoking rates remain stubbornly high, such as among people in manual occupations and individuals who suffer with a serious mental illness. Despite there being 1 million fewer smokers now than in 2014, 6.1 million adults in England are still subject to the devastating harm tobacco causes. Reducing smoking rates is the single biggest thing we can do to improve the nation’s health as it will reduce cardiovascular disease, respiratory conditions and cancer, meaning people can live longer in better health. It will also save the NHS up to £890 million a year, which is of great significance as smoking places a considerable burden on the NHS, costing approximately £2.5 billion a year. 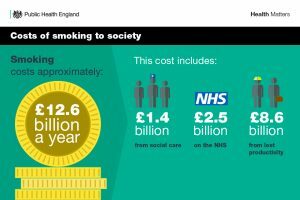 Therefore, reducing smoking remains one of PHE’s key priorities and there has recently been a renewed focus on making England a smokefree nation. PHE is calling for the NHS long term plan to commit to achieving a smokefree society by 2030 with an adult prevalence of 5% or less. In England, around 60% of smokers want to quit, 10% of which intend to do so within 3 months. Currently, around half of all smokers in England try to quit unaided using willpower alone, despite this being the least effective method. Getting support can greatly increase a person’s chances of quitting successfully. There is a widespread misconception amongst smokers and health professionals that most of the harm of smoking comes from nicotine. This is perhaps the greatest obstacle we face as it leads to both nicotine replacement therapy (NRT) and e-cigarettes being perceived as harmful and as a result, smokers may not make a quit attempt using one of these routes. Leading health organisations, including the Royal College of Physicians, Royal College of General Practitioners, and the British Medical Association have all provided advice on the important role of e-cigarettes in helping smokers to quit. However, while nicotine is the addictive substance in cigarettes, it is relatively harmless and almost all of the harm comes from the thousands of other chemicals in tobacco smoke, many of which are toxic. Further, NRT is a safe form of treatment and licensed for use even in pregnancy and for people with cardiovascular disease. This edition of Health Matters focuses on the stop smoking support options that are available in order of effectiveness. There is clear evidence that the most effective way to quit smoking is with expert behavioural support from local stop smoking services combined with stop smoking aids, including the prescription tablets Varenicline and Bupropion, NRT and e-cigarettes. 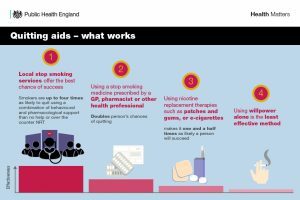 Smokers who get this package of support are up to four times more likely to quit successfully than those who try to quit unaided or with over the counter NRT. Health Matters is a resource for professionals which brings together the latest data and evidence, makes the case for effective public health interventions, and highlights tools and resources that can facilitate local or national action. Visit the Health Matters area of GOV.UK or sign up to receive the latest updates through our e-bulletin. If you found this blog helpful, you can read other Health Matters blogs here. As the Service Manager for a local stop smoking Service and as Specialists in the field, we should be the First point of contact for anyone wanting to stop smoking, not at the bottom of the pile. Pharmacies, Primary and Secondary care are all far too busy to deal with smokers and should be referred into our service as a matter of course. "[...] a smokefree society by 2030 with an adult prevalence of 5% or less." The Tobacco Control Plan for England, published by the Department of Health and Social Care in 2017, defines a smokefree generation as when smoking prevalence is at 5% or below. It also includes the national ambitions that the government has set out, which will help focus tobacco control across the whole system to achieve this. interested to read Mark O Brien's comment. I worked as a SSS manager some years ago and that was the problem then (obviously along with the idiotic quarterly and annual targets that we had then (and the equally idiotic corporate response to any target missed by a few quitters). it ultimately resulted in the distortion of service provision not least its quality and the "farming out" to pharmacies and primary care. if some health professionals, after all these years of trying to educate them that nicotine is not the most harmful element , are still misguided about that (where have they been???) then they are hardly fit to help tranches of smokers quit. it is sad that specialist services are still having to bang the drum about referrals, esp as they are staffed by people truly smoker-centred and passionate about helping people who smoke improve their lives.